Loom knitting is as well referred to as French knitting, reel knitting, spool knitting, box knitting, rake knitting, ring knitting, bung knitting, frame knitting etc. Loom knitting is an historic fine art that has recently found a revival. Knitting nowadays is highly popular all over the world. And the revival of knitting looms in the world of knitting has given all knitters a grounds to smile. Looms were used extensively in the medieval age in countries like Britain, France, Germany and many other places in Europe. People used the technique of loom knitting to knit bags, purses, tasseled caps, petticoats, shawls, hammocks, curtains, nets, petticoats etc. A common opinion is that guild apprentices knit carpets for their masters on frame boards i.e, knitting looms. Knitting looms can be separated in to three basic types- the round loom, the rake loom and the knitting board. The round loom is not necessarily round. It could be a square, rectangle, an oval or even diamond-shaped. All pegs of this loom are necessary to be continuous without any specific starting or stopping point. The distance between the pegs of this loom determines its gauge. A lot of space implies a lot of gauge. There is not a great deal difference between the round loom and the rake. However, the rake, second type of knitting loom, has continuous pegs which have a start and a finishing point. Once Again, the gauge of the pegs in this loom is marked by the distance between them. Only flat knitting can be done on this type of knitting loom. A knitting board is a loom with two parallel rakes. These twin rakes are used to knit across the loom. A double knit fabric can be produced with the help of a knitting board. The gauge of this type of loom is determined by two factors- the length between its pegs and the distance between its rakes. A big gauge is created by a large length between either of the two. Loom knitting is eased by the varying devices on a knitting loom. The knitting looms that have single rows of pegs are called single rakes, while those having double rows of pegs are called double rakes. Knitting materials that have a distinctive right and wrong side can be made with single rakes. A double fabric with both right sides can be made with the aid of double rakes. 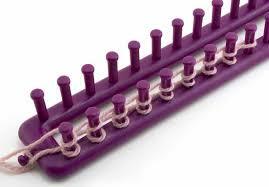 The purpose pegs serve in loom knitting is same as the purpose needles serve in hand or machine knitting. Each peg in a loom is like a knitting needle which is used to produce assorted designs and stitches on a loom. Gauge is the distance between the pegs of a loom. It is this standard of measurement that controls the size of the stitches that can be produced, as also the thickness of yarn that would work the best for a particular loom. Loom knitting has not only made a comeback but also is gaining popularity. It is simple to learn and the knitting looms are uncomplicated to use. Those who have given up crochet and needle knitting owing to arthritis, carpal tunnel syndrome or other such complaints can enjoy loom knitting instead. It does not call for use of needles and is very user friendly. The trend of loom knitting is taking the world by storm and is for certain causing a lot good to the world of knitting. This article was written by Gina Williams, an up and coming authority on knitting. Did you find these tips on Knitting helpful? You can find out a lot more about The Art Of Knitting by going to Knitting Tips.